Whoever thought of first to print the logo on the t-shirt and distribute it must be a genius as till date it remains the best business gift idea. Imagine you have the front, back and even both the shoulders to convey your message on human beings who will proudly wear and display it during day & night and both at outdoor & indoor as the night or leisure dress. 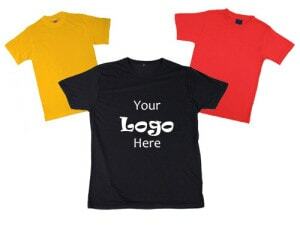 Depending on your budget and target audience you can have t-shirts at different price points without minimum quantity conditions. We challenge you to pass without coming across a promotional t-shirt in a normal routine day. You will notice it early morning while walking, jogging or at the gym. If not the general public on the road then the person behind the counter or the courier boy coming for delivery is wearing it. You get educated about the various brands, sports, events, conferences, teams, religions, groups all in one day. You will also be surprised with the life of the t-shirts because many times the dates are printed of the particular event highlighting the mileage one can get out of this very cost effective promotional medium. The other advantages are that due to choice of every colour and photo quality print and embroidery the t-shirt conveys the brand image extremely well and does not come out very loud as paid advertisement. May be because of this reason all brands prefer to give it to their employees, partners, associates and consumers. Looking at the life and mileage big brands prefer to allocate large portion of their promotional budget for round the year activity around t-shirts. All big corporates have developed a novel idea of merchandising at subsidised rates to make it attractive for the employees and worthwhile for themselves. Employees can buy good merchandise with company logo branding at special rates due to bulk buying by the Company. Company absorbs the additional packing and delivery cost knowing fully well that employees are at least paying substantial amount to proudly associate with their logo merchandise. The formula which is working here is the synergy where employees are matching the cost of the merchandise and Company is absorbing all the incidental cost to make it worthwhile for all involved. Employees can enjoy good merchandise while associating and proudly flaunting company logo and whereas company can justify the extra little cost as investment in exciting talent with meaningful branding. Smart marketing companies have used the same formula by subsidising good merchandise at below cost to their consumers / customers knowing fully well that when the person displays the merchandise the resultant mileage is much more. Instead of always giving it free it is more sensible to bundle and sell it to your brand fans at an attractive price points. Your brand fans will not only pay for it but also flaunt it to give you more mileage out of your subsidised cost. You are not only marketing your products but also doing your brand promotion through your fans to create mass awareness. The name of the game is how to lose little money while selling your merchandise but gain multi fold increase in sales of your products thereby leveraging your overall marketing cost.